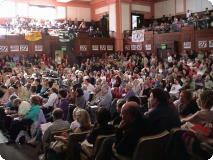 Around 1000 delegates gathered in London for the 2nd People's Assembly for Peace, organised by the UK Stop the War Coalition. 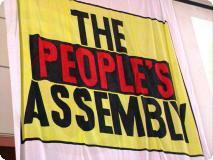 The first People's Assembly met on 12th March as the Britain and the US prepared their attack on Iraq. As well as calling for a halt to the war plans, it expressed its opposition to Britain's anti-terrorism laws. The 2nd People's Assembly was called in response to the exposure over the summer of the lies Blair used to justify the war. 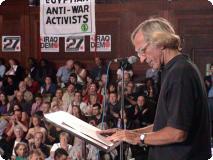 Speakers included Tony Benn, John Pilger, Mark Curtis, and Hans Von Sponeck, formerly the senior UN official in Iraq. Lawyer Louise Christian told the delegates that attack on Iraq and the ongoing occupation were in breach of international law. She also spoke about the plight of the prisoners held at Guantanamo Bay. She said that the British government was "just as complicit in Guantanamo Bay as the US government" and she said that the Attorney General should resign if he fails to bring the British prisoners home. The Declaration agreed by the Assembly reaffirms its opposition to the war, call for the government to be held to account for its lies and demands an end to the occupation of Iraq. The Assembly also backed a resolution from the Campaign Against Criminalising Communities that re-affirmed its opposition to anti-terrorism laws. It called for the release of anyone detained under these laws, condemned the prosecution of people for membership of banned organisations and called for the repeal of anti-terrorism legislation. The first People's Assembly, convened in London by the Stop the War Coalition in March, declared that the impending Anglo-American attack was unlawful, unjustifiable and lacked the support of the British people. 1. That it is now clear that the government of Tony Blair systematically lied to the people and to Parliament about the threat from Iraq in order to manipulate opinion in support of his aggression. In particular, intelligence information was falsified to sustain the argument that the Iraqi regime possessed weapons of mass destruction which could be used at short notice. 2. That this conduct represents a negation of democracy, and exposes as fraudulent the diplomacy conducted by the British government through the United Nations prior to the attack on Iraq. 3. That the government should be held to account by the public and parliament for these lies and this assault on democracy, and that all its actions be opened to full public scrutiny. We need an inquiry into the whole war policy and the thousands of deaths it caused and is still causing, not just the tragic death of Dr David Kelly alone.This People's Assembly further demands an end to the illegal Anglo-American occupation of Iraq, the transfer of political power in Iraq to representatives of the Iraqi people and the withdrawal of all British and US military forces from Iraq. We demand that the British government dissociate itself from all further wars of aggression planned by the U.S. administration under the pretext of the "war on terror", including any attacks on Iran, North Korea, Syria, Cuba, Libya or elsewhere, and adopt instead a foreign policy based on principles of peace and social justice. Since the US-UK military attack on Iraq, governments worldwide have increasingly labelled and persecuted political opponents as terrorist. Britain encourages and assists such attacks. Similar laws are used to undermine civil liberties here too. "We oppose so-called anti-terrorism laws, which are being used to terrorize migrant communities and to criminalize political dissent. Such laws are not needed to protect us but are used to attack civil liberties -- which we will defend." Demand the immediate release of anyone detained under anti-terror laws, especially those being interned without trial. Oppose the prosecution of anyone for alleged association with (or membership in) a banned organisation. Advocate repeal of all anti-terror legislation. We also endorse the two-page summary statement, Terrorising Minority Communities through so-called Anti-Terrorism Powers, which CAMPACC submitted to the Privy Council review of the anti-terror legislation.